Governor-elect Terry Branstad wants new limits on the way property taxes are calculated not only for commercial property in Iowa, but for farmland and for homes, too. “I want to not only reduce the commercial property taxes, but I I want to protect the homeowners and the farmers as well,” Branstad says. 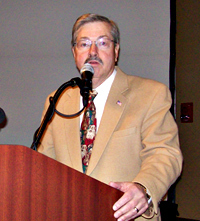 Branstad said without that change, local governments may see a “windfall” in property taxes. During his previous tenure as governor, Branstad supported a freeze on local property taxes, but he’s not calling for that as he prepares to start a fifth term. “We want to make this adjustment in a fair way,” Branstad said. Branstad is asking local governments to limit their use of incentives — like “abatement” programs which lure businesses to build in a certain area because property taxes won’t be collected for five years, while a competitor in an existing building is paying commercial property taxes equal to 100 percent of the value of that property. “That’s a disparity we’d like to correct by saying to local governments, ‘Be careful. You can use abatements if it’s a really important project that you think is critical to your community,” Branstad said, “‘But let’s use it sparingly. '” Branstad says. During the campaign Branstad proposed limiting the property taxes on commercial property to about 60 percent of the value. Commercial property is currently taxed at 100 percent of its value. According to Branstad, businesses in Des Moines pay higher commercial property taxes than competitors in New York City.